Red Tide may be moving closer to Sebastian, Florida. SEBASTIAN – Sebastian Daily contacted the Florida Fish and Wildlife Conservation Commission (FWC) Monday after receiving calls from people claiming to have red tide symptoms. 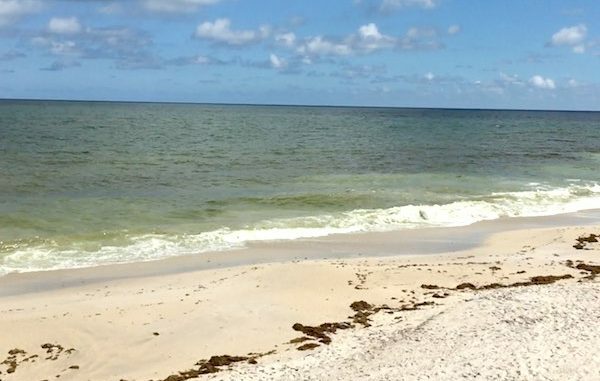 Last week, we reported that there were no signs of Red Tide in our area at that time, according to the Florida Fish and Wildlife Conservation Commission. However, things are much different this week. “Lifeguards at tracking station are wearing masks because it’s so bad,” Lifeguard Michael Flinn told Sebastian Daily. The tracking station is south of John’s Island and 1 mile north of Jaycee Beach. Flinn says a lot of fish are washing up, but Round Island isn’t bad at this time. “It must have popped up overnight,” Flinn added. There are over a dozen dead fish approximately 100 yards on the beach near John’s Island. Some people are reporting sore throats. “We’ve been coughing all morning, and it’s only been worse since we walked the beach this morning,” a resident, who wishes to remain anonymous, told Sebastian Daily. On Monday afternoon, Sebastian Daily investigated the beach south of John’s Island, which appeared to show signs of red tide. There were dead fish on the beach, the air made us cough, and we now have sore throats. “It’s definitely red tide, you can smell it, makes you cough,” John Naft told Sebastian Daily. “We’ve seen it before, I don’t know, ten years ago, it was even worse than this,” Naft added. The county took a water sample, but they are waiting for the results to come back before they decide whether or not to close the beaches, according to Flinn.